Rochester’s most engaging vocal competition returns for its eleventh year in CLASSICAL IDOL, Saturday, April 8, 2017, 7:30 P.M., in an elegant gala at Temple B’rith Kodesh, 2131 Elmwood Avenue in Rochester. Widely recognized as an essential career step for vocalists pursuing professional performance at the top levels, CLASSICAL IDOL provides the opportunity for young artists to compete before a live audience and receive real-time commentary from established authorities in the field. Selected from national and international applicants, vocalists come to Rochester for the semi-final round of the competition, held at Asbury First United Methodist Church on April 7. Panelists choose ten contestants to advance to the final round on April 8. 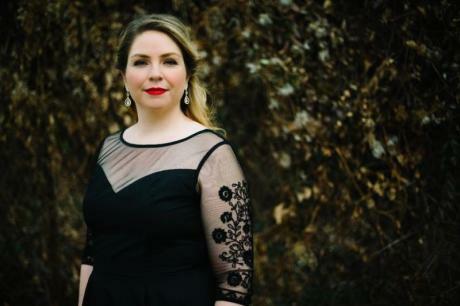 In this gala event, ten rising stars of the international vocal performance scene demonstrate the expressive power of the human voice through polished renditions of the most moving classics of opera, art song and oratorio. Their thrilling performances mark careers in the making as distinguished judges offer constructive commentary in real-time. Cash awards and concert appearances go to the top performers. The evening begins at 7:00 PM with a Wine and Cheese Tasting where audience members can participate in the Silent Auction. Emcee Julia Figureras (WXXI Classical 91.5 FM) will then take the stage at 7:30 PM as the competition commences in a cabaret setting. Elegant desserts will be served at intermission, along with light refreshments. At the conclusion of the evening, the audience votes for “Audience Favorite” before grand prizes are awarded. Judging this season are ERIE MILLS, Metropolitan Opera soprano, coach and mentor to young performers; CONSTANCE FEE, international performing artist, Associate Professor of Vocal Performance, Director of Vocal Studies at Roberts Wesleyan College; DOUGLAS KINNEY FROST, internationally-active opera conductor; and JONATHAN BEYER, international baritone solo artist. ERIC TOWNELL, Artistic Director of the Rochester Oratorio Society and Rochester Lyric Opera, chairs the panel, and JULIA FIGUERAS, Music Director and Mid-day host for Classical 91.5 FM, emcees the April 8 gala event.